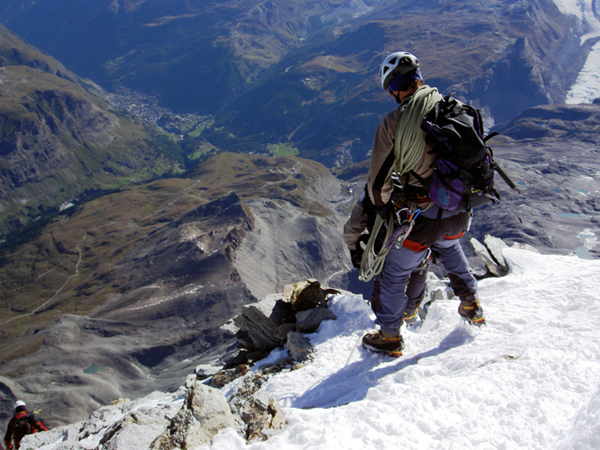 In September 2005, we successfully summited Mont Blanc, the highest mountain in western Europe. 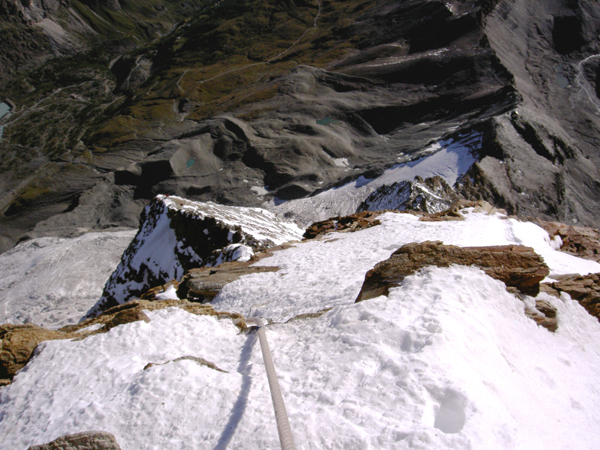 Although the climb itself was relatively short, waiting for clear weather in Chamonix took some time. 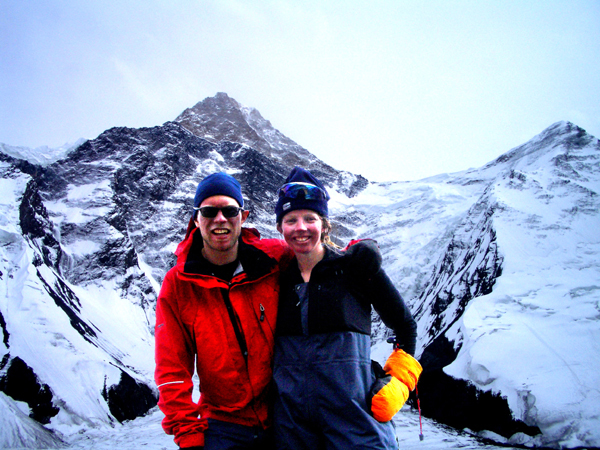 After we arrived, we sat through 5 days of solid rain – which meant solid snow up higher. By the time the weather cleared, an enormous amount of snow had fallen and we were concerned about the increased risk of avalanches, so we decided to reshuffle our plans and hired a car to visit northern Italy. After a week of great pasta, gelati, and more architecture and galleries than we could possibly absorb, we were back in Chamonix – and thankfully the weather was looking great. 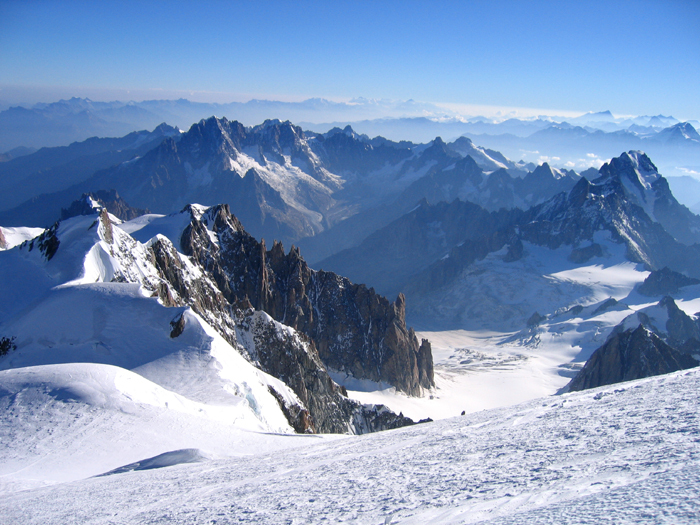 We chose not to climb the “normal route” – partly due to difficulties booking the hut that you need to stay in (Aiguille du Goūter) and partly due to the increased risk of avalanches on this route. So instead we climbed via Aiguille du Midi (the cable-car that gets you onto the mountain) and through Mont-Blanc du Tacul and Mont Maudit. This route is longer and includes one steep section. The hut is about an hour’s climb from the chair lift and we spent 2 nights there to try to acclimatise. (Two nights was possibly not quite enough as Fiona experienced some nausea towards the top). On summit day, we woke at 1:00am for “breakfast” and headed off left about 1:30am using head torches to light the way. Most of the route was very straight-forward (although a bit exposed in sections), with one almost vertical section where a fixed rope is used. We used ice-axes and climbed roped up to each other the whole way. Watching the sunrise over the Alps in the morning was a spectacular site as we steadily moved up the mountain. The last section seemed to go on forever but we finally made it to the summit at around 8:30am. The weather was great and the views from there were unbelievable. We were amazed to see some of the climbers (climbing from the other side) had brought up paragliders and we enviously watched them sailing off the mountain (they’d take only around 20 minutes to get down, while we still had another 6 hours or so ahead of us!). We arrived back at the hut at around 3pm, rested for a while and then climbed the final leg to the cable-car in time to catch the last one back to Chamonix. That night we were back in civilisation, staying in a hotel and eating at a restaurant – what a luxury European climbing is! For this trip, they decided to use guides as they had heard that finding the route was difficult (and climbing off the route could potentially end in problems). 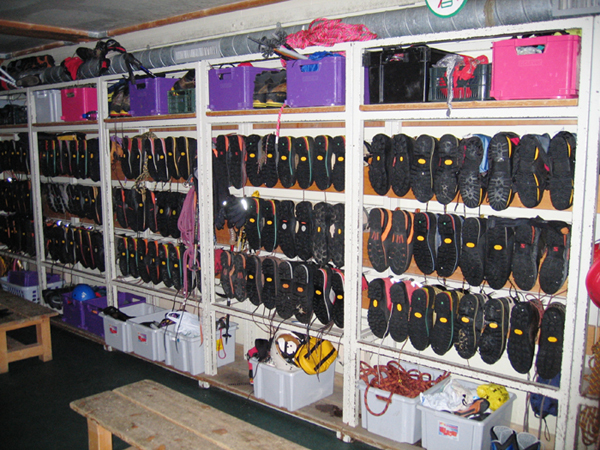 After spending some days hiking and climbing nearby to acclimatise, they hiked into Hörnli Hut to spend the night. Next morning, they rose early, but after some delays with gear, ended up being the last group to leave at approximately 6am. The climbing was technical, reasonably exposed, and with the guides setting a relentless pace, they were constantly overtaking other groups. After stopping for a very short break near the Solvey emergency shelter, they reached the summit at around 9am. Due to the steepness of the route, coming down took about the same amount of time with almost all of the route being down-climbed. They arrived back in the hut at around midday. 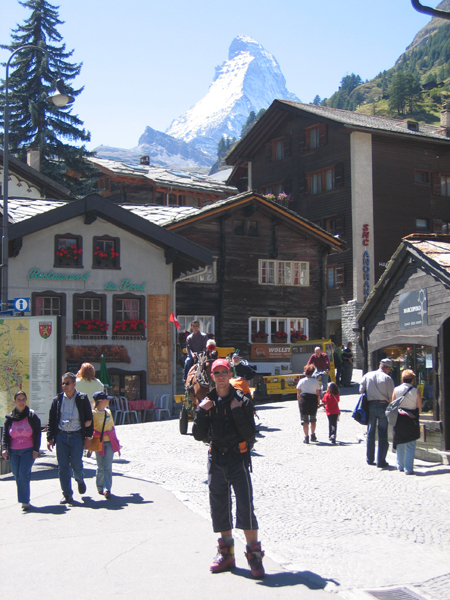 After resting here for a while, they continued onto Zermatt and back to the comforts of their hotel. 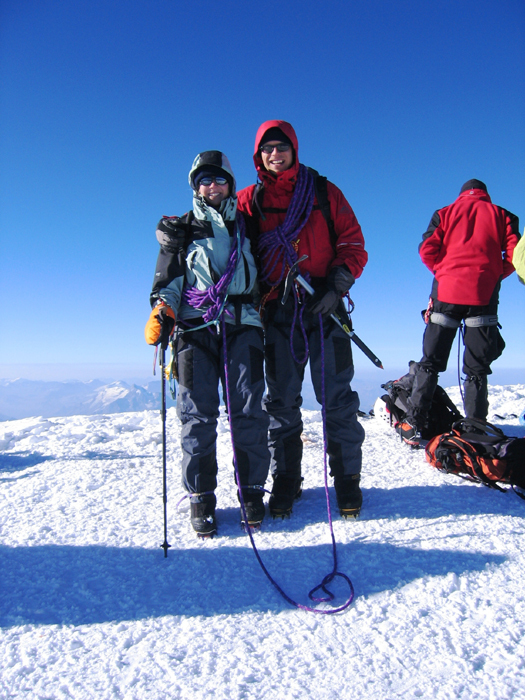 In August 2004, Fiona and Paul climbed Khan Tengri – the most difficult climb they have done (for more reasons than one). 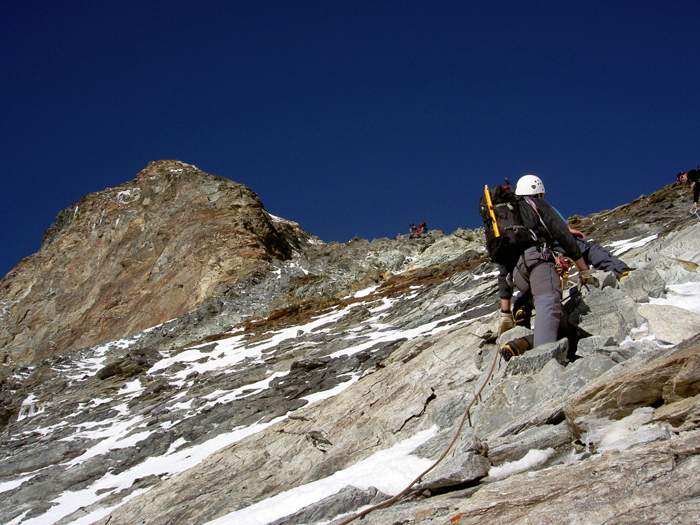 We elected to climb on the north side – which is much more technically challenging, but is fairly safe from avalanches. To get here, we flew into Almaty, and then took a bus to Karkara. From here we did an acclimatisation hike (getting to around 3200 metres) before flying into Base Camp (4000 metres) by helicopter the next morning. Base Camp is very well set up – you pay a fee to use a tent and for all your meals as well as getting access to other facilities such as a doctor and “shower tent”. Meals turned out to be a real highlight – somehow the staff were able to prepare the most amazing food from their tiny kitchen tent. The next day we walked most of the way to Camp 1 – mostly a long snow slope with a few hundred metres of steep climbing near the camp. After a rest day the following day, we took a load of our gear all the way to Camp 1 – taking around 9 hours return. After another rest / acclimatisation day, we were ready to leave the relative luxuries of Base Camp. We hauled ourselves up to Camp 1, spent the night there in a fairly small campsite, and then continued up to Camp 2 at about 5400m the next day. The climb from 1 to 2 was long and very challenging in parts – not helped by the poor weather which deteriorated as the day went on. With plenty of steep sections where fixed line is used, it took us almost 12 hours to complete. 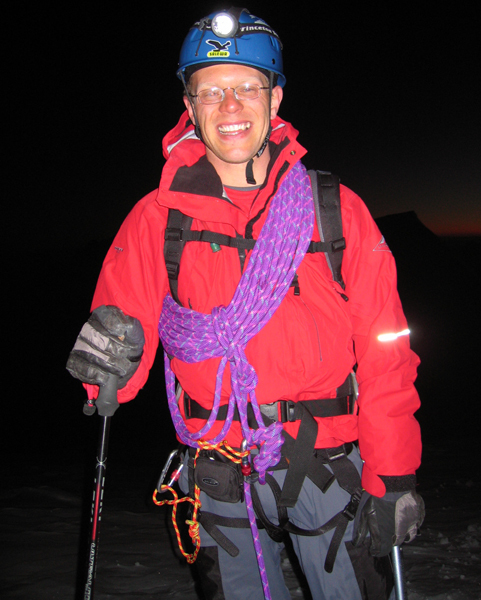 After a rest day, Paul made the trip back down to Camp 1 to collect our remaining gear. This meant we now had all of our gear and plenty of food and fuel at Camp 2 – which was lucky as the weather set in, causing us to wait it out for 5 days. Eventually, the weather cleared and we headed up to Camp 3 – electing to camp on top of Mount Chapayev (a smaller mountain on the route) rather than drop down to the usual Camp 3. From here we sat out another day due to howling winds and then continued up to Camp 4. 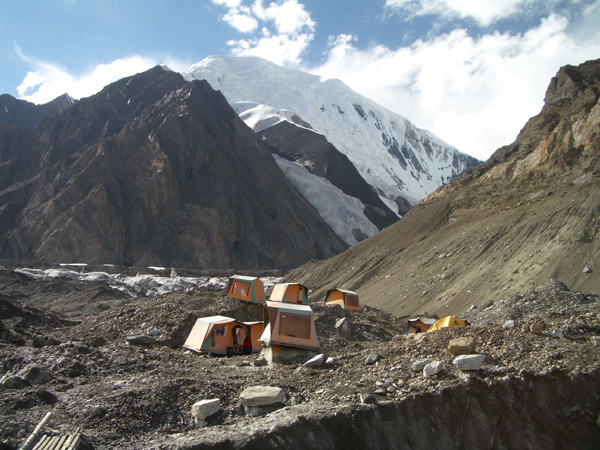 This camp is not included by most climbers but we had been told it vastly improves the chances of success as it makes the summit day shorter. It is a tiny campsite set on a small snow platform between rocks (room for only 1 tent). At around midnight, we were woken to find torches shining on our tent which turned out to be from some climbers who had been to the summit and were still on their way down – they would have summitted too late in the day. They opened our 2 person tent and came in – boots and all. We spent a very uncomfortable night worrying about piercing our tent and having it rip open to the howling winds outside. They left in the morning without a word of thanks. After having very little sleep, and waking to hear the winds continuing, we decided to have another rest day. The following day was a beautiful clear day with very little wind. However, it was icy cold and on our side, the sun didn’t hit us until around 11am. During this time we both got very cold hands and feet. The climb up was quite technical for the first half, and then a never ending snow slog towards the summit. When we got back down to our tent, we were dismayed to find that Paul had frostbite on most of his toes, and Fiona had some on her thumbs. We did our best to rewarm them. 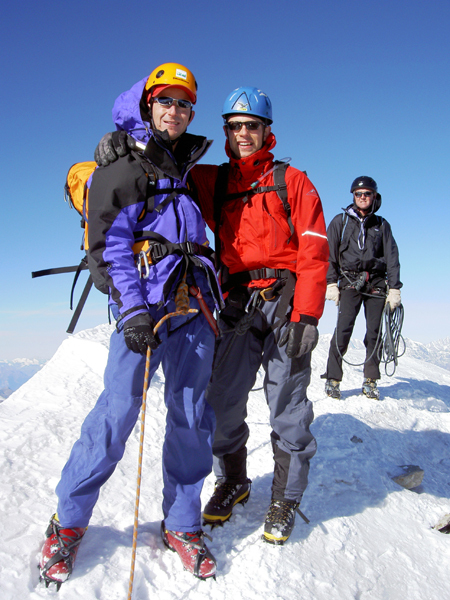 By the time we got back down to Base Camp, it seemed that Fiona’s thumbs would be ok but Paul’s toes were a concern. After receiving all kinds of contradictory advice from various doctors and climbers who had experienced or seen frostbite, we decided it was time to leave Kazakhstan as quickly as possible. When we eventually got home to Melbourne, we sought advice from various specialists (although it is difficult to find anyone in Australia with frostbite experience) and began having hyperbaric treatment in the Alfred Hospital. This treatment was for an hour twice a day and lasted for 3 weeks. In the end, Fiona’s thumbs made a full recovery but the ends of some of Paul’s toes had to be removed. While this doesn’t affect him now, the experience was fairly traumatic and not something we intend to repeat. For a more detailed account of this climb, go to climb.outmarket.com.au – the website we used to post updates as we were climbing. In April 2002, we summitted Mount Kilimanjaro – Africa’s highest mountain. 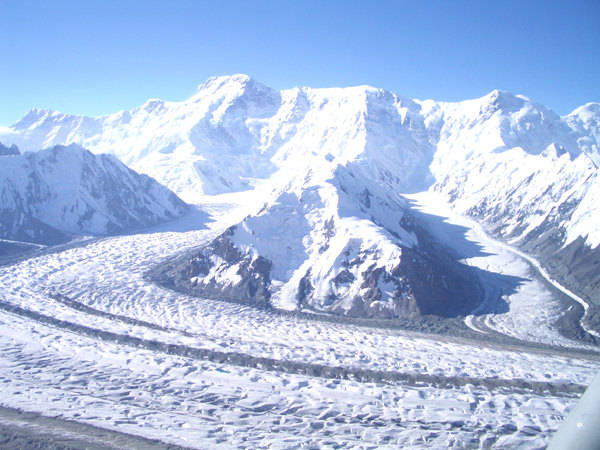 Initially we were planning to climb up one of the ice routes and began our trek up from the West side, however on seeing the state of the ice, we decided to traverse around the mountain to where the crater rim could be more easily reached. Trekking into the mountain was very different from most climbs due to the different climate zones that you pass through. One moment we were hiking through a rain forest complete with monkeys squawking as we passed through, and the next we were walking amongst misty alpine meadows. The climb itself is not technical and so many groups seem tempted to move towards the summit quickly and then suffer from altitude problems later. 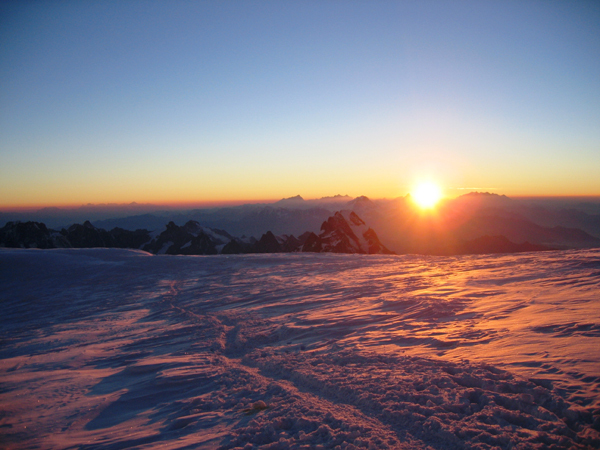 Our own local guide wanted us to leave our high camp the same night that we arrived, but we insisted on waiting a day to be properly acclimatised. On summit day we left at around midnight and slowly made our way to the lip of this enormous volcano. Seeing the sunrise slowly as we continued around the rim to the highest point was amazing. We arrived on the summit at around 7:00am and admired the brilliant landscape of ice features, low settling clouds and majestic colours from the morning sun (despite the freezing temperatures). The trip down was a very long day. We walked back down to the High Camp, rested for an hour or so, and then set off again to get back down to town that night. Several hours of this were spent slopping our way through ankle deep mud! The first big mountain we climbed was in January 1998 when we climbed Mount Aconcagua – famed for being the world’s highest mountain outside of the Himalayas. Leaving from the Argentinian town of Mendoza, we caught a bus to Puente Del Inca, from where we made arrangements to have some of our climbing gear taken into Base Camp by mule. The next day we set out for Casa de Piedra (the camp midway to Base Camp), and the following day onto Base Camp. Like most people we suffered a little from the altitude at this point as we had moved from 2700m to 4200m in only 2 days (and were pretty much at sea level prior to that). We spent a day resting and hydrating and soon felt much better. This was our first time experiencing a Base Camp situation and we enjoyed observing and interacting with the other climbers from all around the world. When people heard that we were from Australia, there standard response was “what are you doing here!??”. I don’t think we fit their Crocodile Dundee expectations! We were amused to watch a large group arrive and unpack carton after carton of Evian water. Clean, cold glacier water was only a few metres away! The following day, we carried a load of our gear up to Camp 2 at 5400 metres (there is a Camp 1 but most people don’t find the need to use this camp). We found this to be a hard day with the climb up taking around 6 hours. After another day of rest for acclimatisation, we packed up the remainder of our gear and set off up the mountain. Now much better acclimatised, this time the climb up took us only 4 hours – the body’s ability to adapt is amazing! We had planned to have a rest day here and during this day, we walked up to Camp 3 (only a few hours away). We found the campsite to be crowded and dirty from people relieving themselves too close to camp. Cooking dinner later that night, two Swiss climbers whose tent was near ours returned having just summitted from Camp 2. Inspired by their success and given the relatively short distance between camps 2 and 3, we decided to make our attempt from Camp 2. The next morning we woke to perfect weather and set off for the summit at around 6am. By 10am we had caught up to a large guided party that had left later from Camp 3 and we decided to stay behind them. 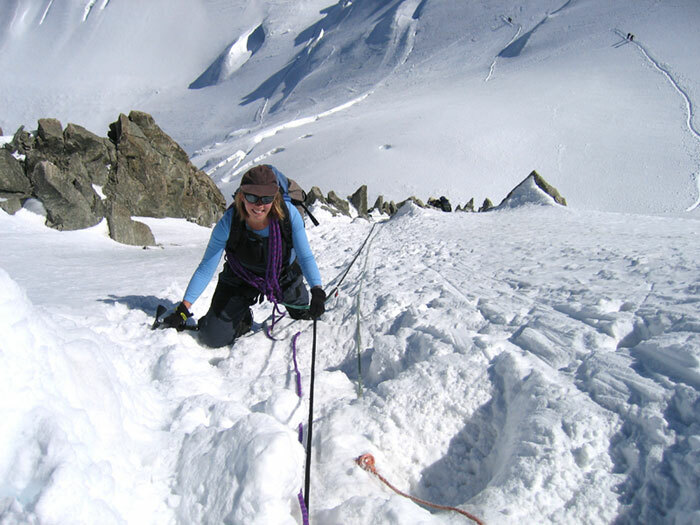 With moderate – high wind we were unsure whether we would be able to cross through the Travesia (a long, exposed traverse section). However we watched the guided party go with little difficulty so tucked in behind. Once through the Travesia, we came to the Canaleta – a moderately steep section with loose scree. It seems that here you take 3 steps forward and 2 backwards the whole way up. 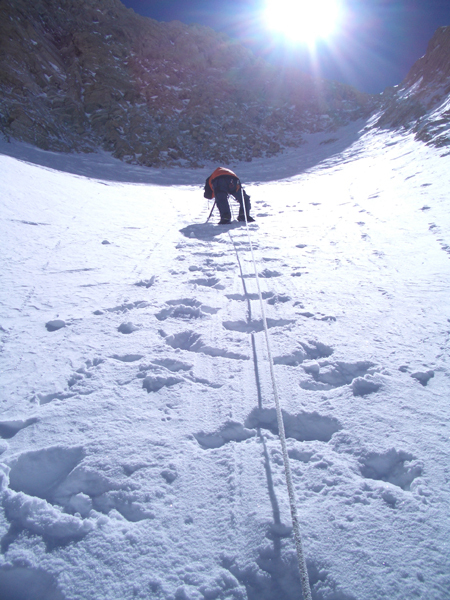 Until now we had been climbing very strongly but at this point, we began to slow and tire. In fact the last hundred metres to the summit seemed to last an eternity and if it wasn’t for us hearing the elated voices of those ahead that had clearly got there, we may have turned around. But we pushed on upwards and thankfully got to the summit where we were able to relax for a while and get some fuel back into us (water, muesli bars, etc). Feeling much stronger we headed down and finally made it back to our camp at around 9pm – just before sunset. The next day we walked down to Base Camp and out to Puente Del Inca. In January 1996, we visited Nepal, planning to climb Mount Parcharmo – around 6000 metres in the Rowaling region. As students, we travelled in the university holidays – as it turned out, this was not the best time to plan a climb in Nepal! From Kathmandu, we flew into Lukla where we were greeted with around 40 porters – all wanting work. We of course negotiated and chose one who had climbed Parchamo previously and offered a good rate. He said he had proper boots and climbing clothes but did not have a tent, so we gave him some extra money to rent a tent. Once he had collected his things, we set off. The trekking in Nepal is absolutely amazing – highly recommended to anyone that hasn’t been. Unless you’re climbing you don’t need a tent or any gear other than a sleeping bag and your own clothes. The people are extremely friendly and the scenery is awe-inspiring. With our porter in tow, we trekked up through Namche Bazaar and onto Dingboche and Tengboche as acclimatisation before attempting our climb (which was out to the west of Namche rather than towards Everest). However, it seemed that this year the weather had been particularly unusual. Anyway, there had been an enormous amount of snow and none of the trekking teams were able to get through to Everest Base Camp. Also many high towns had been forced to evacuate and move down to lower areas. Regardless of this, we still decided to attempt to climb Mount Parcharmo and headed out and up the valley towards Thami. We were concerned to find our porter still wearing his jeans but assumed that he knew better. Once past Thami the snow on the path became very thick and soon after, the path disappeared entirely. We continued on, crunching our way up the valley. The snow was so deep that at one point it seemed strange that there were hard areas underfoot – until we realised that we were literally walking over buildings and walls that surrounded a town that was covered in snow and had been abandoned! Our poor porter must have been very wet as he was still walking in his jeans and runners, but he assured us he was fine. At the end of a long day, we found a spot for a campsite and set up our tent. It was only now that we realised that our porter did not have a tent (despite assuring us he would arrange one). He said he would sleep in the snow – but of course we couldn’t allow him to do that. The temperatures were freezing. So with 3 of us in our lightweight 2-man tent, our porter using a down jacket we had as a sleeping bag, we attempted to get some sleep. In the morning, we packed up and continued hiking up the valley towards Parcharmo. But after only an hour or so, our porter decided that he was leaving and no amount persuasion would convince him to continue. So now we had more gear than we could carry but continued on regardless. We left a bag of gear there and about 3/4 through the day, Paul headed back to pick up this bag, while Fiona got her bag and Paul’s other gear, and set up camp. All the time we were walking in snow up to our thighs or waist and meanwhile it continued to snow. Exhausted, that night we set about cooking dinner and somehow managed to get kerosene in our food – making it inedible. What a day! We woke the next morning to find that it had continued to snow heavily through the night and there was no sign of relief. It was about then that Paul said something like “how about we go to Thailand?”. Fiona didn’t need too much convincing! So we packed as much of our gear up that we could carry and spent a very long day trekking through the now even deeper snow, made worse by the extra weight we were carrying. But we eventually made it to the small town of Shyanboche. Unbeknown to us, in Nepal New Year’s Eve is celebrated across a few weeks with each town taking it in turn to host festivities. We had coincidentally stumbled across the New Year celebrations and despite our protests, the host family insisted that we join in. This meant having our share of the “delicacies” on offer which included oranges, peanuts, lollies and rice wine – all carefully dished out to each guest. We felt extremely guilty taking these foods which were obviously so precious here, but which we could enjoy any day we wanted to at home. We were enjoying sitting on the periphery of the celebrations when our most humiliating moment came – they wanted to be shown what “English dancing” was like. Again we protested, but to no avail and so finally gave in and did some sort of dance. That Nepalese town now has a very strange idea of “English dancing”! The following morning, we were able to catch a ride back to Kathmandu on an old Russian helicopter which had delivered some supplies. So unfortunately, our climbing in Nepal was not to be at this time. However Thailand was great – and instead of mountains, we explored the underwater world by doing our PADI diving course on the islands there. 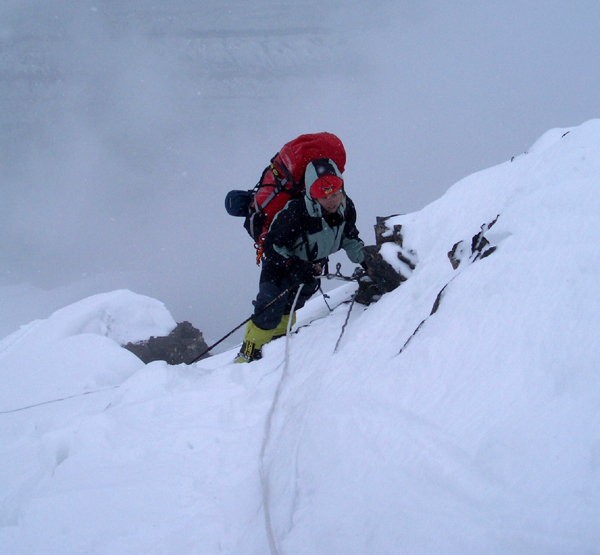 In January 1994, Paul headed off to New Zealand for his first taste of mountaineering. Having signed up to do a mountaineering skills course designed for people with rock climbing background, he met the team in Mount Cook. Six days were spent practising self arrests, crevasse rescue, placing ice and snow anchors, and a host of other skills necessary for safe mountaineering. 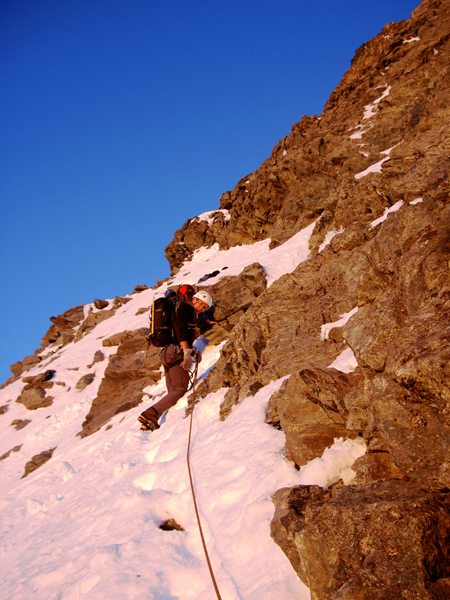 After the course Paul then went on and climbed several peaks in the New Zealand Southern Alps. 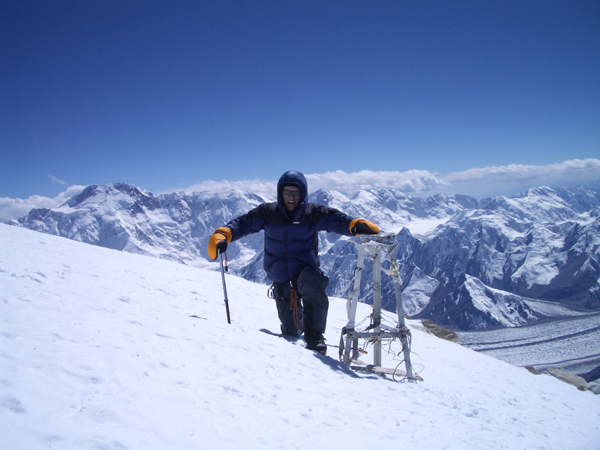 In 2006, Paul Adler and Fiona Adler attempted to climb Mount Everest. We posted live updates here throughout our climb, sharing our journey with friends, family and other interested parties. Here is the daily blog from this adventure.